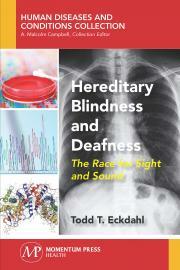 This book presents examples of hereditary blindness and deafness that illustrate the large variety of genetic diseases that affect vision and hearing. It describes seven hereditary eye diseases, three genetic syndromes that cause deafness, and four types of nonsyndromic deafness. The author explains the diagnosis of hereditary blindness and deafness in children and adults and describes the patterns of inheritance of blindness and deafness, illustrating each with family scenarios. The practice of genetic testing is described, which can provide information that prospective parents can use to make reproductive decisions. The text also presents treatments and therapies for hereditary blindness and deafness such as hearing aids, cochlear implants, and corneal implants. It describes future prospects for diagnosing, treating, and curing hereditary blindness and deafness, including experimental drugs, stem cell therapy, preimplantation genetic diagnosis, and gene therapy.